"Machine Learning Frameworks For Building More Intelligent Apps"
"5 Benefits Driving Enterprises Towards Cloud Computing"
When we say about mobile app development, there are two major streams - iOS and Android. To develop iOS and Android apps, we need experts in Swift or Objective C, Java or Kotlin, Cocoa Touch, Android SDK, XML and the list keeps growing with libraries and other testing tools. For instance, with React Native, developers can code the app by adding multiple modules to perform on various smartphones in a similar manner. This is why today's developers prefer React Native and the biggies like Facebook, Instagram and Walmart etc are using react native apps. 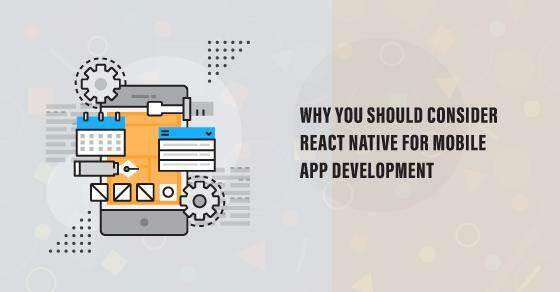 If you are planning to create highly reliable, flexible, and interactive apps, React Native will be the right choice. Let’s look at the promising features of React Native to develop your next mobile app in a quick and effective way. Reusability is a key feature of React Native. In React Native the building blocks are treated as native components that can be compiled directly into the native languages of Swift or Objective C for iOS and Java or Kotlin for Android. Simply, with React Native you can share Application logic across the two platforms which means, we can nearly reuse 70% of code between iOS and Android. It's worth mentioning, Facebook stated that their Ad Manager application has 87% of code reuse across the two platforms. React Native allows more agile and rapid approach in mobile development without sacrificing quality and usability.